Halloween is here and if you're like me, than you tend to put off planning that perfect costume until days before your annual party. Or in my case..... my postponed Halloween party (thanks Hurricane Sandy). My procrastination always leads to a costume that I don't love or I end up resorting to the always trusty 'whoopie cushion' outfit, and then run into six other people wearing the same thing. That's the mark of a failed Halloween costume. This year, I decided it was time to start planning early, get creative and have an original costume to proudly display!Thanks to the help of Kmart, I was able to get this little do-dad together in a jiffy. Plus, in case you aren't familiar, Alison Goldfrapp is one half of the duo that makes the band Goldfrapp. She's not one for the spotlight, but given her knack for amazing fashion and catchy tunes, she's been a top musical influencer and repeat Grammy contender for almost a decade. Madonna, Kylie Minogue and Gwen Stefani have all been heavily influenced by Alison's glam-rock fashion. Model Kate Moss dressed identical to Alison's stage outfits in recent years. Coldplay personally asked her to go on tour with them and she received her invitation into fashion history when she was photographed for Vogue. Lucky lady! and used a piece of construction paper, some gold tissue paper, tape and ribbon. It's kindof ghetto, but ya know what.... it'll do juuuust fine! - Assemble your outfit. Attach the flower pin in the middle of the sweatshirt. 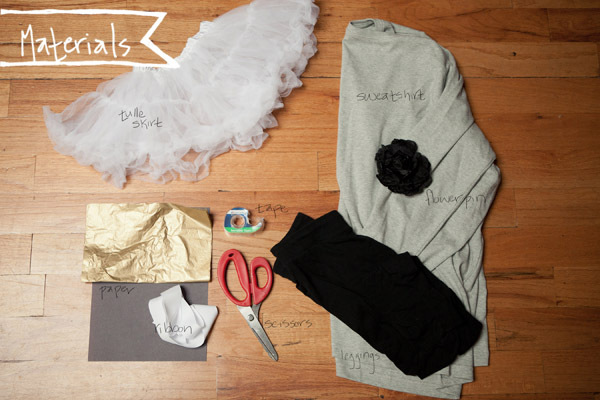 - Place the tutu over your head and pin to secure it if the waist is too baggy. - Throw on your party hat and you're ready! Would love to know, what are some of your favorite bands? If you were to do a DIY of a musician, who would you choose?